Past imperfect: facts, fictions, and fraud: American history from Bancroft and Parkman to Ambrose, Bellesiles, Ellis, and Goodwin · One Book. One Author. One Hour. Notes on front and back end papers concerning the four plagiarism cases covered in the text, paraphrasing versus plagiarism, prizes for historical writing, 19th century historians versus 20th century academic historians, the birth of New History, and a list of important American historians. Annotations by Brian Lamb in the margins and underlining of pertinent phrases throughout the book. Brian Lamb asks: “What about Stephen Oates?” “What does a plagiarist look like?” “What is the professional division of the American Historical Association?” In laid note is a list of three video clips showed during the interview with the author. 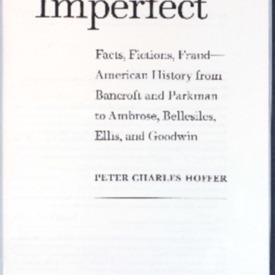 Hoffer, Peter Charles, “Past imperfect: facts, fictions, and fraud: American history from Bancroft and Parkman to Ambrose, Bellesiles, Ellis, and Goodwin,” One Book. One Author. One Hour., accessed April 21, 2019, http://booknotes.gmu.edu/items/show/673. Woodrow Wilson, like many men of his generation, wanted to impose a version of America's founding identity: it was a land of the free and a home of the brave. But not the braves. Or the slaves. Or the disenfranchised women. So the history of Wilson's generation omitted a significant proportion of the population in favor of a perspective that was predominantly white, male, and Protestant. "That flaw would become a fissure and eventually a schism. A new history arose which, written in part by radicals and liberals, had little use for the noble and the heroic, and rankled many who wanted a celebratory rather than a critical history. To this combustible mixture of elements was added the flame of public debate. History in the 1990s was a minefield of competing passions, political views, and prejudices. It was dangerous ground, and, at the end of the decade, four of the nation's most respected and popular historians were almost destroyed on it: Michael Bellesiles, Doris Kearns Goodwin, Stephen Ambrose, and Joseph Ellis." "This is their story, set against the wider narrative of America's history. It may be, as Flaubert put it, that "Our ignorance of history makes us libel our own times." To which he could have added: falsify, plagiarize, and politicize, because that's the other story of America's history." --Book Jacket.